Here’s what we sent in our Members First email last week. It’s with great pleasure that I present to our Members a World Record catch! Recfishwest Member and Broome Fishing Club stalwart Ben Little, landed this 3.45kg threadfin salmon on fly on 3kg tippet in Roebuck Bay, Broome, back in April 2018. Ben received official confirmation of his world record status from the International Game Fishing Association yesterday. Although threadfin salmon grow much bigger, recent high abundances in Roebuck Bay gave Ben the opportunity to pursue this Fly-caught World Record. Here’s Ben below with a cracking Roebuck Bay specimen caught in 2014. So why is this so important? Fishing in Roebuck Bay is currently the best in living memory – but this wasn’t always the case! Fisheries management changes that removed commercial netting in Roebuck Bay back in 2013, has allowed for iconic species such as threadfin salmon and barramundi to thrive, with record catches a common occurrence. 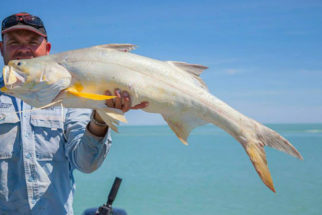 Ben’s World Record threadfin was caught at a spot called ‘The Fingers’, known previously to be an average fishing spot due to low abundances of threadfin and barramundi. Ben said the threadfin fishery in the bay, on the doorstep of Broome, has been exceeding all expectations since 2013 and can only be described as World Class – with shore based fishers now catching fish up to 95cm! Although Ben’s fish wasn’t released, he was fishing that day as part of a recreational fishing licence money funded project involving indigenous custodians the Yawuru people tagging threadfin salmon for science, to understand their population and movements in Roebuck Bay. It’s amazing to watch this fishery evolve into one of ‘World Class’ status and great to see the fishery managed in a way that maximises the value to the community. So next time you’re in Broome, chat to the locals, head to the fishing club, drop into the tackle stores and ask how you can catch yourself a threadfin in Roebuck Bay!